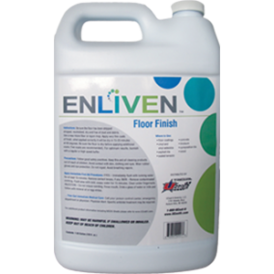 Enliven Floor Finish is a technologically advanced 25% solids sealer and finish, and is the easiest finish you’ll ever apply. While providing a high gloss, clear durable surface Enliven Floor Finish resists scuff marks and scratches and is slip resistant. With its quick dry time of 15-20 minutes you can quickly get back to using the area. 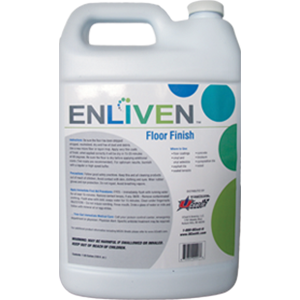 Be sure the floor has been stripped with Enliven Floor Finish Remover, neutralized with Enliven Neutral Floor Cleaner, dry and free of dust and debris. Use a new micro fiber or rayon mop. Apply very thin coats of finish, when applied correctly it will be dry in 15-20 minutes. Be sure the floor is dry before applying additional coats. For optimum results, burnish with a regular or high speed buffer.